‘Mala’ (garland in Hindi), a site-specific work, responds to the landscape of Mongolia. Drawing from the Eastern ritual of garlanding idols, the artist has embraced the land with a mala. 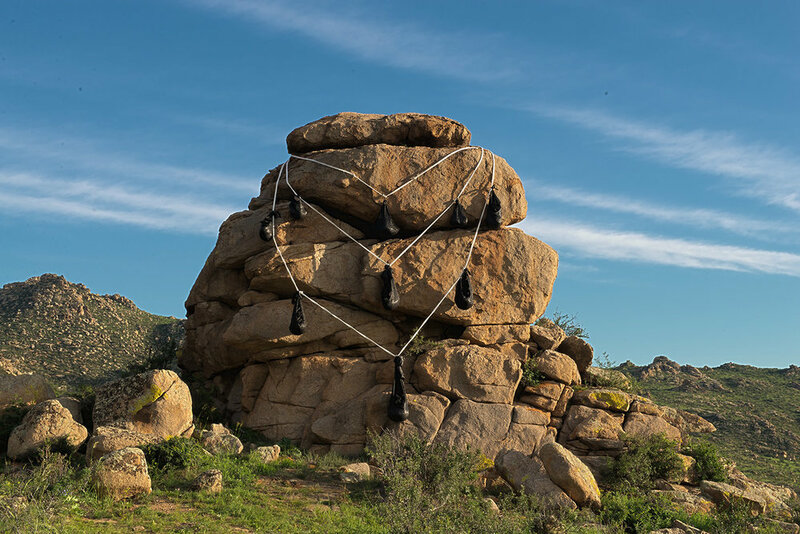 A monumental 8-meter high granite rock formation emerging in the valley neighboring to the Land Art Mongolia (2018) camp, was the chosen site for enacting this ritual. 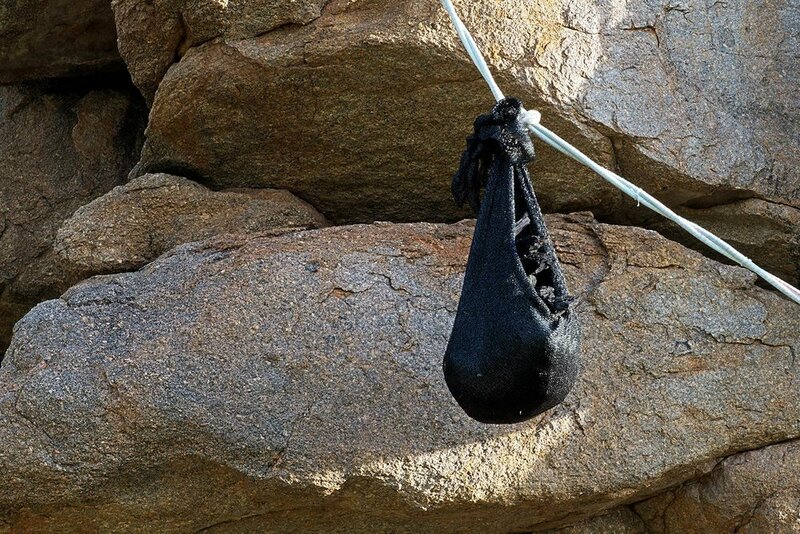 Sacks of coal were strung across the mala, bringing into conversation the changing relationship with the land. Traditionally, living off the land in Mongolia meant a sustenance earned from the pastoral lifestyle - herding across the land’s lush pastures. This notion has changed over the years as the Mongolian State is also living off the land by aggressively extracting mineral resources from rich subterranean deposits - affecting rapid economic growth. The coal hung on the mala was procured from the Chandgana Tal mine near the camp in Murum Sum. Visible for kilometers as one drives past the mine on the Eastern highway, Chandgana Tal extracts 3.6 million tons each year, and at present has exhausted one tenth of her reserve. Expressing gratitude for what Mother Earth has bestowed upon one, a mala is often strung with offerings - at times sources of energy one lives upon, such as edible items. For ‘Mala’ the artist has made an offering of a relatively new source of energy in human history - coal. This gesture highlights the resources on the land and those underneath - one, which tends to replenish, the other, not. The artist would like to thank Maygmarsuren.D, Naymdavaa.J and Surenjav for making this work possible. Their skill in knotting, arranging and climbing introduced a local aesthetic and knowledge to the work. Supported by Richard Jochum, Elizabeth Prins and Junichiro Iwase.